Ross County came from behind to secure a well-deserved win over Hamilton Accies at the Global Energy Stadium. The hosts edged the first 45 minutes with Hamilton goalkeeper Ryan Fulton making a fine one-handed save from a Billy Mckay header. However, Michael Gardyne was slow to react in the box, giving Greg Docherty a free header to give Accies the lead. 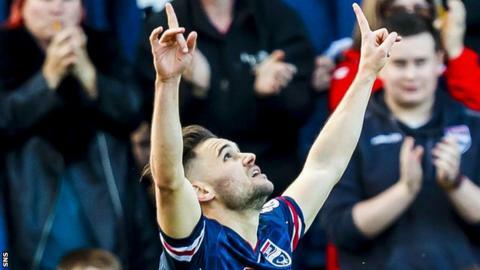 Alex Schalk headed Ross County level and Thomas Mikkelsen won it for the Staggies with a fine low finish. The first half was a bruising affair as both sets of players showed plenty of determination and aggression; Ross County captain Andrew Davies setting the tone with a crunching tackle on Steven Boyd to earn a yellow card. That seemed sensible as most of the challenges were uncompromising rather than illegal - although Staggies' stopper Marcus Fraser might argue with that after suffering a cut eye following a collision with Rakish Bingham's elbow. What it certainly did was limit the amount of fluent football on view, but the home side did produce the best of what was on offer, with right-back Jason Naismith the main threat to the Accies three-man defence as he raided forward effectively at times. His driven cross was flicked on at the front post by Craig Curran, with youngster Davis Keillor-Dunne turning the ball into the side netting at full stretch. Shortly afterwards Naismith's pass put the recalled Billy Mackay through, but Alexander Gogic produced a wonderful last gasp tackle to prevent the former Caley Thistle striker scoring. Then Gardyne released Naismith down the right and only a magnificent save from Fulton prevented Mackay heading Owen Coyle's side in front. Naismith took it upon himself to try to break the stalemate after more good work by Keillor-Dunne down the left set the defender up for a shot which he steered just wide of the target. Hamilton's main threat seemed to come from set pieces and so it proved when the home side made a real hash of defending a Steven Boyd corner from the left. Docherty is hardly the tallest player in the Accies side, but the midfielder - whose goal kept the club in the Premiership last season - was able to steer a header from six yards into the roof of the net. In fact he nearly made it two a few minutes later as the visitors broke quickly on the counterattack, but Docherty could not take advantage as he fired a shot wide of the target from just inside the penalty area. It was a costly miss as Ross County levelled and it was no surprise that Naismith had a crucial role in the goal as once again he sped clear down the right to provide the cross that substitute Schalk headed home. Then to make matters worse Accies were caught short handed at the back and substitute Mikkelsen took full advantage to drive in his fourth goal of the season. Corner, Hamilton Academical. Conceded by Marcus Fraser. Louis Longridge (Hamilton Academical) is shown the yellow card. Ryan Dow (Ross County) wins a free kick in the attacking half. Foul by Xavier Tomas (Hamilton Academical). Attempt missed. Greg Docherty (Hamilton Academical) right footed shot from outside the box is close, but misses to the left. David Templeton (Hamilton Academical) wins a free kick in the defensive half. Goal! Ross County 2, Hamilton Academical 1. Thomas Mikkelsen (Ross County) right footed shot from the centre of the box to the bottom left corner. Assisted by Alex Schalk. Attempt saved. Michael Gardyne (Ross County) left footed shot from the centre of the box is saved in the centre of the goal. Foul by Thomas Mikkelsen (Ross County). David Templeton (Hamilton Academical) wins a free kick in the attacking half. Substitution, Ross County. Ross Draper replaces Jamie Lindsay. Attempt missed. Darian MacKinnon (Hamilton Academical) right footed shot from outside the box is just a bit too high. Substitution, Hamilton Academical. David Templeton replaces Steven Boyd. Attempt missed. Andrew Davies (Ross County) header from the centre of the box is too high. Corner, Ross County. Conceded by Scott McMann. Attempt blocked. Michael Gardyne (Ross County) right footed shot from long range on the right is blocked. Foul by Louis Longridge (Hamilton Academical). Jason Naismith (Ross County) wins a free kick in the defensive half. Attempt missed. Dougie Imrie (Hamilton Academical) left footed shot from the left side of the box is close, but misses to the left. Goal! Ross County 1, Hamilton Academical 1. Alex Schalk (Ross County) from a free kick with a header to the top right corner. Scott McMann (Hamilton Academical) wins a free kick on the left wing. Attempt saved. Davis Keillor-Dunn (Ross County) right footed shot from long range on the left is saved in the centre of the goal.